Sammy and Gunner are the newest members of our herd. They have enjoyed visiting PCC, The Golden LivingCenter, and ECU Rehab and Wellness in Greenville among others. When the small but big hearted minis come around the corner, they catch everyone's eyes and capture hearts. Horses are very emotional animals that read what is going on around them and help in the best way they know how; just being there. With mini horses being about the size of a Great Dane, they are easy to navigate through hallways, in elevators, up /down stairs and into classrooms /patient’s rooms. We look forward to introducing our amazing minis to you! Please call 252-752-0153 to schedule a visit from the minis. This program was featured on the front page of The Daily Reflector and on WITN with Lynnette Taylor. 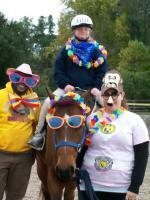 We offer ground school and therapeutic riding lessons to veterans. No horse experience is required! Please call the barn at 252-752-0153 to schedule a barn tour. 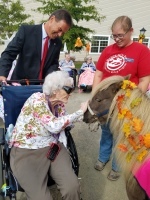 In the fall 2015 we introduced a new partnership with Vidant and offering a Healing with Horses Cancer Survivors group . Participants will take part in an hour long horse activity followed by an hour of group therapy facilitated by Jennifer Higgins, Vidant's oncology social worker. This program is equally funded by Vidant and Rocking Horse Ranch and will have a small fee of $25 for the entire session for participants. Please call 252-752-0153 to schedule a barn tour if interested in this program. This video was featured at the 2014 Derby Dash Bash. Please watch it for an overview of what we do at Rocking Horse Ranch Therapeutic Riding Program in our therapeutic riding lessons. Many thanks to those who made this video possible, including Nick, Melissa and Olivia.